Home » News & Events » Looking forward to Spring! Here at Arundel Arboretum, a tree nursery in Sussex, we are fully prepared for Spring. Whilst March has not been the traditional start to spring (especially after the crazy temperatures of February! ), with its gales and storms, we can still look forward to the lighter evenings and eventually warmer days! The delivery of our new stock for the ensuing season is now complete, following earlier visits to our trusted Italian and Spanish suppliers. Visiting our suppliers is very important to us; and something that we always do. This way we are able to hand pick our stock making sure it’s perfect for you. We have been with our suppliers for many years now. Getting to know reputable suppliers that consistently produce exceptional quality, disease-free stock is not only vital to us and our reputation; but equally to the industry overall. It also helps ensure that you will receive the best quality product available. We have a fantastic range of new plants in stock at our tree nursery in Sussex including an inspiring range of Olea europaea (Olive), Cordyline australis, Trachycarpus fortunei and some beautiful varieties of Agapanthus. With our flowering cherry trees and magnolias, we are starting to see some fantastic bursts of spring, which are transforming the look of our tree nursery daily. 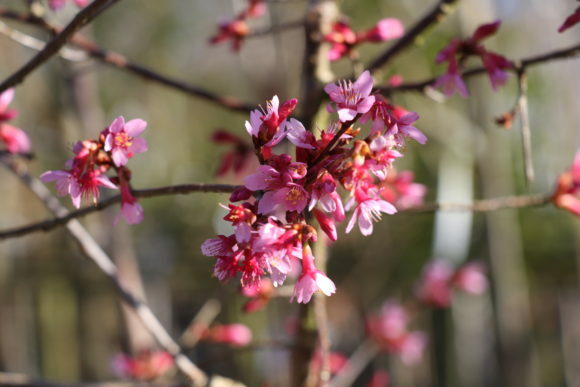 We thoroughly enjoy this time of year – watching all of our trees and shrubs bursting into new life with buds, leaves and blossom, that can then in turn transform your garden or project too. Prunus ‘Kursar’ is a small deciduous tree, which has a spreading habit. Its ovate coppery young leaves turn a deep orange in the autumn. Single, deep pink flowers adorn this tree in the spring. Prunus ‘Kursar’ prefers to grow in full sun in either a sheltered or exposed position. Plant in a moist, well drained soil. It has an eventual height and spread of between 4-8m. Prunus ‘Okame’ is a splendid small tree with ascending branches. These are covered with an abundance of shell pink single flowers in March and April. The dark green leaves turn orange and red in the autumn. It has an eventual height of approximately 4m and a spread of 4m. It is therefore an ideal tree to consider for a small garden. 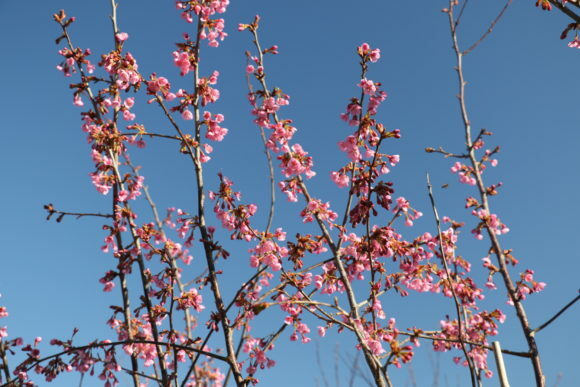 Prunus ‘Okame’ can be planted in full sun, in a moist, fertile soil. It will not, however be happy in waterlogged or permanently wet conditions. It is tolerant of pollution and popular with bees. Camellia japonica ‘Alba Plena’ is believed to be one of the oldest camellias in cultivation. 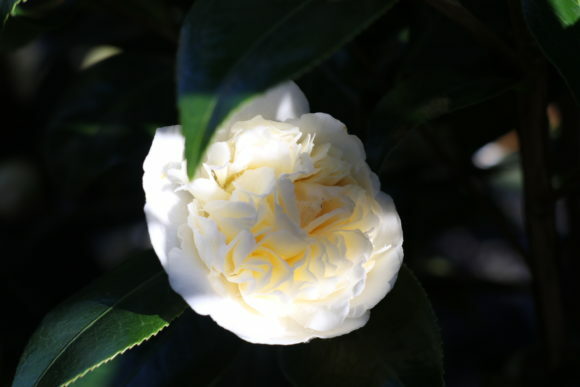 This variety of Camellia is adorned with beautiful white double flowers in the spring, which are complemented with evergreen glossy green leaves. Camellia japonica ‘Alba Plena’ has an upright and bushy growth habit. It is a relatively slow grower with an eventual height of 6’-8’. It can be grown in full sun or partial shade – but protect from early morning sun and direct hot, sunny conditions. Equally, it should be protected from cold, dry winds. If you are looking for some inspiration for plants with spring interest, then why not pop into our tree nursery in Sussex? We will be delighted to show you around and advise on the best plants for your garden.